Knotted Cotton: Belated Happy New Year! This cheery little creature is on the Artist Trading Card I received from Samantha in the pre-Christmas Very Berry Handmade ATC swap and I love him so much that he didn't go away after Christmas and is living on my bookshelf. I just like his friendly optimistic expression. I think I am back on course so please come back because we will be revealing our quilts, inspired by this years' Challenge theme Literature, on 1 February. Cute Artist Trading Card, I can see why you want to keep him around. I look forwrd to seeing your quilt and glad your back to blogging. How exciting Catherine, I am really looking forward to seeing your challenge quilt. Yes I understand perfectly about putting things off. The Four in Art quilt group does sound intriguing. I tried to click on Flickr but it wouldn't let me in. Looking forward to seeing your quilt. Oh....and a happy new year to you, too! Happy to see you back - and looking forward to seeing the quiltiness. Ponder and then panic... sounds like a lot of us are in the same boat! Hope the panic stage is past and the creating has started! Love the little ATC - he definitely needs to stay around! Tax totally does that to me too! In fact my life does that to me-there always seems to be something boring that needs doing before I allow myself sewing time! 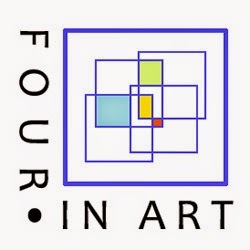 I think I have seen work from Four in Art around the place before (but the link is private) And it will be fantastic to see what you do. Their values around experimenting are great, if it's the group I think it is. Welcome back! I would agree about the snowman's friendly expression. I look forward to seing the quilt reveal. What a lovely ATC! Mine is still up too, but could happily stay up permanently, it was a great swap. That's a very cute ATC you got, Catherine! The one I made for my partner got lost, so I had to remake it again. The second time it arrived. :-) I am looking forward to seeing your quilt, it's a very interesting theme. It's a pity though that the link to Flickr group is private, would've been nice to see all the quilts. Uh, yes, I know that kind of feeling when you cannot enjoy your "stolen" freetime when you should be doing something else! It's good to have you back! Yes, I know that feeling too. Your snowman is gorgeous and the good thing about catching up late here is that now I don't have to wait at all to see the literature reveal, which is great because I am very intrigued.